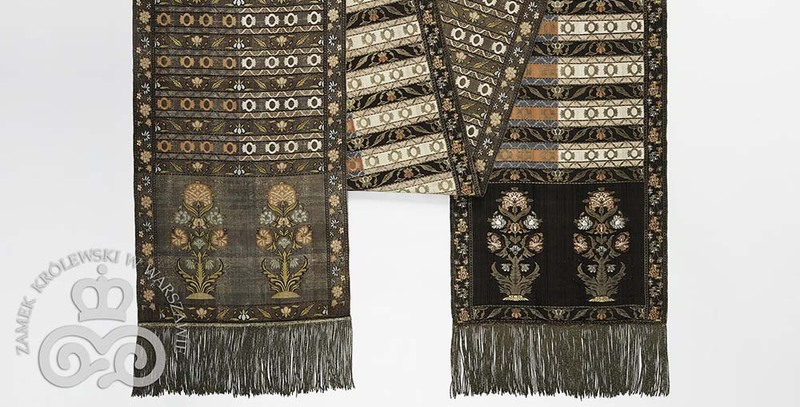 Originating from Persia and other places in the East, the kontush sash, an ornate band worn around the waist, was a staple of the Polish nobility’s attire in the 17th and 18th centuries. Once symbols of their owners’ status and of Old Poland’s unique fashion, kontush sashes nowadays are cherished museum artefacts. The Turkish and Persian bands were longer and shorter, broader and slimmer, exquisite and ordinary, all silk, variously coloured and patterned, having plenty or little golden and silver additions. We owe this to-the-point description of the kontush sash to Jędrzej Kitowicz, the noted Polish chronicler who lived at the height of this garment’s popularity in the 18th century. The sash was an ornate band tied by Polish noblemen around their waist over what was known as a kontusz, a kind of characteristic robe with its sleeves cut from the armhole to the elbow. The kontusz (pronounced: kon-toosh) was worn over a long lined undergarment, a dress called a żupan (zhu-pan). These items, along with trousers whose legs were tucked into boots and a warm, high-crowned cap called a calpac, made up a typical Old Polish nobleman’s outfit. The sash was the least practical and the most decorative element of the lot. A bit like the modern-day tie, it was meant to be a fashion statement. Like much typical Old Polish attire, the sash was of Eastern origin. 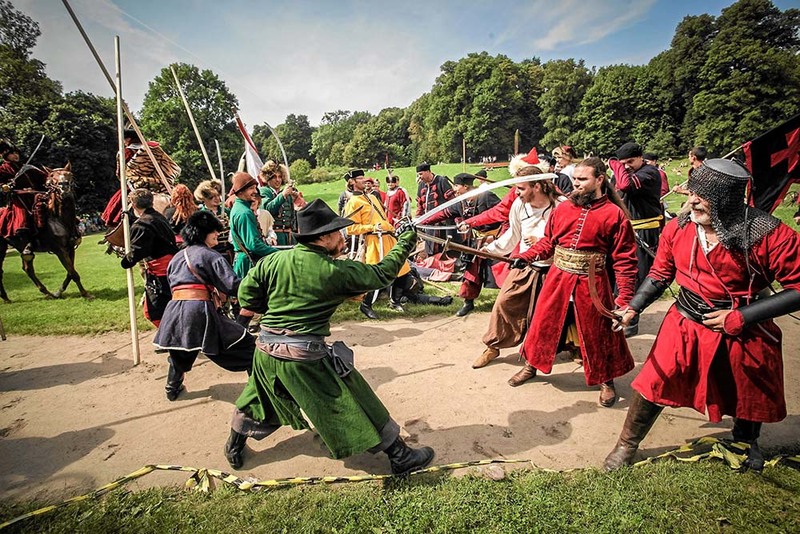 In general, Polish men’s fashion of the early modern period was strongly influenced by that of the Ottoman Empire, to the extent that when Sobieski was defeating the Turks during the 1683 Battle of Vienna, his Polish troops were dressed almost exactly the same way as their opponents. The kontusz sash, however, which became a standard element of clothing in Poland in the late 16th century, is primarily of Persian influence. In that era, ornate Persian bands were being brought to Poland mainly by Armenian merchants. Trade contacts with the Orient resulted also in the import of Indian and Turkish sashes. At first, the Polish gentry tied their waists with headwraps, common in Eastern cultures, altering their original purpose. 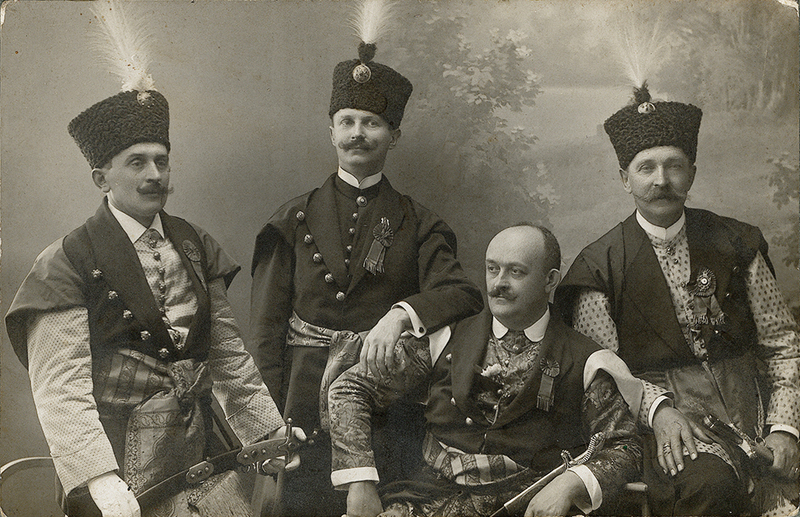 When Poland became an established market for sashes, artisans in Persia and the Ottoman Empire began manufacturing bands especially for it, ones meant to be worn around the waist rather than around the head. The canonical form of the kontusz sash crystallised in the 18th century. On average about 35cm wide and 4m long, the sash consisted of three main parts. The ‘heads’ were especially ornate fields at its endings, meant to be elegantly exposed after tying the garment. The ‘background’ was the middle section of the belt, usually crossed by stripes. The ‘edgings’ were, well… they were simply the edgings, patterned in most cases. The endings would also have tassels. Kontusz sashes were very finely woven from silk or wool, using golden as well as silver threads. Their manufacture involved the use of mangles to give them an even shine. Until the 18th century, they were made exclusively abroad, with Persia being the main producer, but that started to change after the country was raided by the Afghan Ghilzai in the 1720s. Weavers, often Armenians and Turks, left Persia and made their way to Poland, where local workshops opened. One of the first workshops in Poland and also the most renowned one, operated in Słuck (pronounced: Swoo-c-kh), a town in today’s Belarus. Like many of Poland’s earliest establishments of this kind, it was opened by an aristocratic family, in this case the Radziwiłłs. Its history can be traced back to 1746 when production began under the supervision of an Armenian going by the Polish name of Jan Madżarski. The workshop was so successful that in its heyday it employed over a 100 people and the expression ‘Słuck sash’ became synonymous with ‘kontush sash’. Madżarski didn’t simply copy popular designs – a common practice in some Polish workshops. He designed his own sashes, in a style referencing the best traditions of the noted Persian weaving city Kashan. Also highly popular with Polish noblemen were bands from a manufactory in Kobyłka near Warsaw, founded in 1778. It was run for a couple of years by the French weaver Francois Selimand, who is credited with bringing momentum to the enterprise, which wasn’t necessarily developing very dynamically before his hiring. He later went on to work at another successful sash workshop, opened by the Armenian merchant Paschalis Jakubowicz in Lipkowo, also near the capital. It isn’t clear though whether Selimand designed the belts at these establishments or just acted as a manager. New designs were surely created at the workshop in Grodno, a city also now in Belarus, which was founded on the orders of King Poniatowski. There, designers brought in from France were tasked with introducing Western aesthetics into the traditional kontusz sash form. This didn’t prove to be a sound concept and the manufactory never became profitable, eventually shutting down in 1781 after operating for about a decade. Other noted producers were located in Kraków, Buczacz (in today’s Ukraine) and Stanisławów. Most workshops placed a unique signature on their products making it easy to identify the birthplace of a Polish-made sash. Also, some producers had their trademark embellishments – for example, the Słuck manufactory often put oval floral patterns at the ends of its bands. In general, the aesthetic of the sashes was a mix of Persian, Ottoman and also Chinese influences that included some elements characteristic of French Rococo. The latter were however incorporated not only directly from France but also through Oriental weaves impacted by that art style. 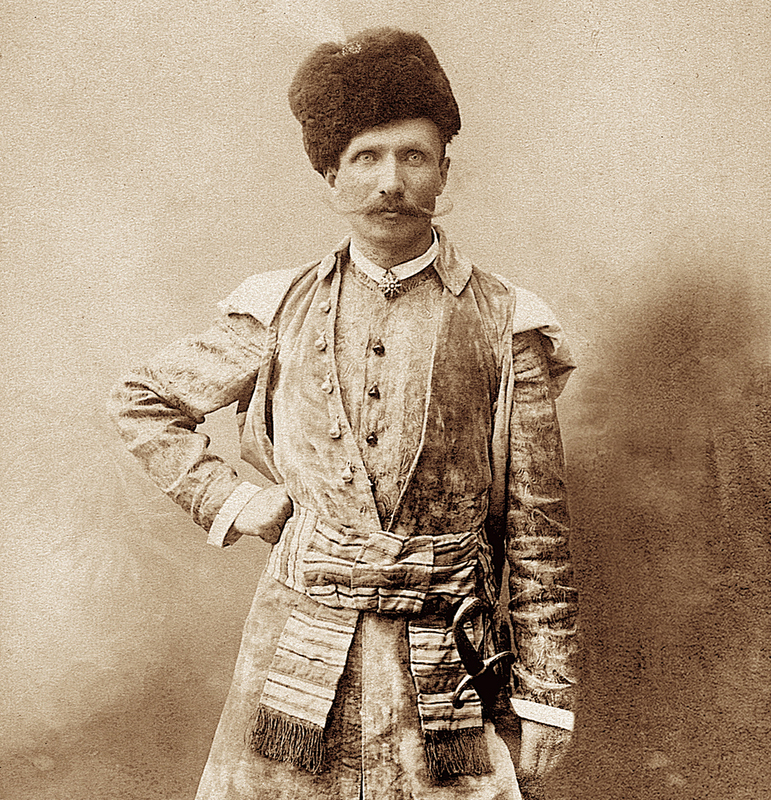 The kontush sash was possibly the most characteristic element of the Old Polish nobleman’s dress which itself, because of its richness and Oriental aura, was unique compared to other fashions from European countries at the time. The sash showed the status of its owner: a wealthy aristocrat could have a gold-dripping, custom-made belt from his own manufactory, whereas a nobleman of modest means could have one featuring no silver or gold at all, produced by a workshop copying existing designs. The demise of the Old Polish outfit began toward the end of the 18th century, when Poland was partitioned by Russia, Prussia and Austro-Hungary. At the time, French fashion was becoming more and more popular with the nobility, causing kontush sashes to be worn less often. After the November Uprising in the 1830s, won by the occupying Russian forces, the traditional Polish outfit was banned and sashes along with it. The law quickened their fading. The Słuck workshop closed in 1846, later than most of the others, and eventually kontush sashes stopped being worn altogether. Nowadays, they are cherished museum artefacts, seen by visitors to places such as the Royal Castle in Warsaw and the National Museum in Poznań.